“It just shows you Michael Jackson is the most sought after and most collectible celebrity of all time. It was just phenomenal. People flew in from Asia, Russia, all over. Now that he’s gone, we now realize the true legend we lost,” said Julien. 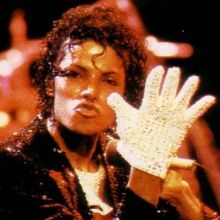 The glove had been expected to sell for between $20,000 and $30,000. The winning bidder was Wanda Kelley of Los Angeles, who also bought a number of Jackson’s albums at the auction. She said she was prepared to go higher if necessary.